The Department of Journalism and Mass Communications welcomed more than 250 high school students and media advisers to campus on Sept. 28 for the annual High School Media Workshop. This event provided learning opportunities for students working in a variety of high school media. Sessions included: evaluating news, advertising sales, sports still photography, latest trends in memory books, InDesign basics, Facebook Live, careers in the media, social media, crafting an effective ad, looking good in print, asking better questions, and crafting a solid news story. Two super sessions were offered. One featured Murray State television production students and faculty. The session looked at the winners of this year’s video category. Tips and in¬sights for strengthening news, sports and features were provided in the session. Newspaper and multimedia students could participate in a super session in the newsroom of The Murray State News. Attendees learned about the sections of a college newspaper and how to use AP style. The students recorded a segment of the “Murray State Minute” webcast. The session was taught by the adviser and students of The Murray State News. High school media advisers were able to participate in a curriculum swapshop, best practices, and group discussion sessions. An AP style competition was offered as part of the Workshop. JMC faculty/staff teaching sessions included: Robert Valentine, Wm. Gross Magee, Brent Norsworthy, Dr. Melony Shemberger, Chris Haynes, Dr. Kevin Qualls, Dr. Stephanie Anderson, Dr. Debbie Owens, Elizabeth Thomas, Gill Welsch, Dr. Tim Vance, Orville Herndon, Dr. Marcie Hinton, Leigh Wright. Sessions led by professionals outside the JMC department included: Dana Statton, University Libraries; Jeremy McKeel, MSU Digital Media Services; Valerie Ezell and Amey Graybeal, Jostens; and Shelley Street Byrne, The Mayfield Messenger. Leigh Wright served as the director of the High School Workshop. She was assisted by Marion Hale. Winners of the High School Media Competition were announced prior to the beginning of the workshop. A complete list of winners can be found on JMCJournal.org. The 2019 High School Media Workshop is scheduled for Sept. 27. 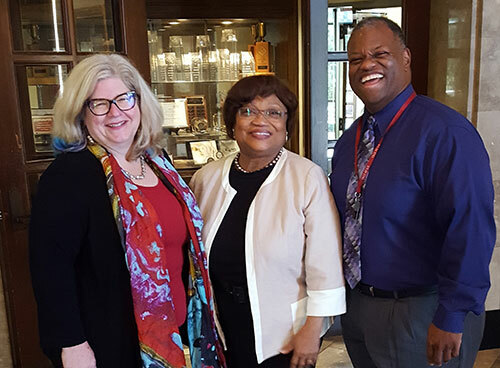 Dr. Mary M. Meares, left, and Dr. George Daniels, right, of the University of Alabama-Tuscaloosa, discussed their school’s diversity initiatives with Dr. Debbie Owens. Over the summer Owens was selected to head up diversity and inclusion initiatives in Murray State’s Arthur J. Bauernfeind College of Business. During fall break, Dr. Debbie Owens traveled to the University of Alabama-Tuscaloosa where she met with representatives of the College of Communication and Information Sciences (CCIS) to discuss its diversity plan. The meeting was hosted by members of the college’s Diversity Forum, Dr. George Daniels, assistant dean for administration, College of Communication and Information Sciences, and Dr. Mary M. Meares, associate professor, Department of Communication Studies and chair of the Human Resources Committee. The college’s diversity initiatives have been nationally recognized by the Association for Education in Journalism and Mass Communications (AEJMC) and used as a model for the International Mass Communication Training and Research Center. CCIS initiatives include the use of multiple instructors to teach diversity-focused courses and diversity advocacy training for faculty and staff. Owens said she intends to highlight aspects of UA’s model as examples of “best practices” for innovations in diversity and inclusiveness both within the JMC department and at the collegiate level. In November, she represented the A. J. Bauernfeind College of Business at the 2018 Diversity and Inclusiveness Summit sponsored by Association to Advance Collegiate Schools of Business (AACSB) in Phoenix. Doc McGaughey, left, Ryan Brooks and Ann Landini share memories at The Murray State News reunion in October. The first issue of The College News can be seen here. 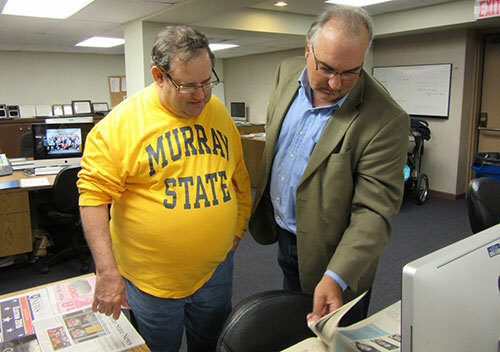 John Mark Roberts, left, and David Ramey look through some of the old issues of The Murray State News they helped produce in the 1985-86 school year. 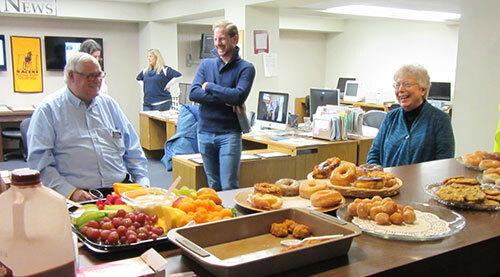 The paper celebrated its 90th anniversary with a newsroom reunion prior to the Homecoming football game. Issues of The News from August 2012 to present can be found online on the paper’s Issuu channel at this link. Amy Bryan Watson, award-winning broadcast anchor and journalist, was one of the 2017 recipients of the Distinguished Alumni Award. Murray State presents the Distinguished Alumni Award annually to alumni who have made meaningful contributions to their profession on a local, state and national level. Established in 1962, the award is the highest honor granted by the Murray State University Alumni Association, and its recipients include Pulitzer Prize-winning journalists, renowned authors, research scientists, physicians and educators. 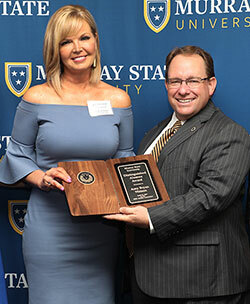 Amy Watson received the University’s Distinguished Alumni Award from Murray State President Dr. Bob Davies. Watson graduated in 1989 with a degree in journalism. During her undergraduate career, Watson was a part of Alpha Omicron Pi sorority and was heavily involved with MSU TV-11 News as an anchor, reporter and producer. Ever since she was a young girl, Watson knew she wanted to become a broadcast journalist. Her first few years after graduation consisted of working with different broadcast news stations across Missouri, Tennessee and Kentucky. In 1990, she joined KFVS, a CBS affiliate, as a general assignment reporter and fill-in anchor in Cape Girardeau, Missouri. A couple years later, Watson moved to Chattanooga, Tennessee and joined another CBS affiliate, WDEF, as a weekend anchor and general assignment and consumer reporter. In 1993, Watson returned back to Kentucky to continue her career, this time with the NBC affiliate, WPSD-TV in Paducah. For thirteen years, Watson was a part of the WPSD-TV team as the six and ten o’clock anchor, the five o’clock anchor and a special assignments reporter. Watson’s time with WPSD-TV came to a close when she and her husband Derrick, a fellow Murray State alumnus, moved to Hopkinsville to be closer to his job in 2006. However, her absence from broadcast news did not last long. Later that year, WTVF-TV, the CBS affiliate in Nashville, Tennessee hired Watson to be the co-anchor for the 4-8 a.m. morning news. She continues in this position to this day, earning multiple awards during her tenure. Since Watson joined WTVF-TV, the 4-8 a.m. news has been ranked as the number one morning news in Nashville for the last ten years, as well as being ranked number one nationally in metered markets. Her reporting and morning news show have earned twelve Emmy nominations over the years and won Emmy awards for best special event coverage, best morning broadcast and weather coverage. Watson has even been honored by the Associated Press, earning awards for best reporter, best feature story, best news writing and best planned stories. Watson gave credit to a Murray State faculty member for helping her along the way. 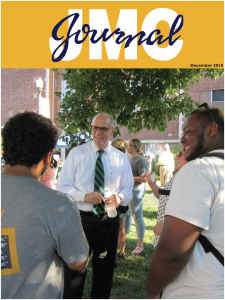 “Ironically, and thankfully for me, one of my dad’s best friends is Dr. Robert McGaughey, former long-time chair of the Murray State journalism department. He, personally, helped me tremendously throughout my career, and I am forever grateful for all his support,” said Watson. The alumna has also served as a mentor, allowing Murray State journalism students to shadow her at WTVF-TV and critiquing students’ resumes and audition tapes. 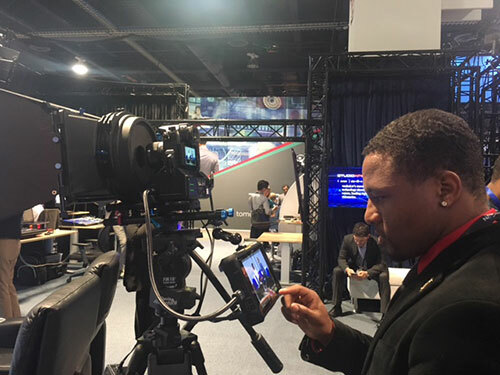 “When I was a student, Murray State’s own television studio in the journalism and mass communications department really gave me those real-world experiences that prepared me for my career. We did it all. Whether it was anchoring, reporting and editing, we were learning how broadcast journalism pieces together. I am so thankful for those experiences,” said Watson. Watson was honored at the Distinguished Alumni Award banquet April 21. 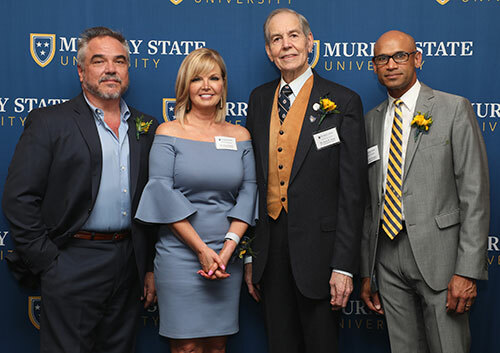 Four outstanding Murray State University alumni were selected as the 2017 recipients of the Distinguished Alumni Award: W. Earl Brown, ’86, Dr. Jesse D. Jones, ’64, Dr. Vishwas Talwalkar, ’89 and Amy Bryan Watson, ’89. The recipients were honored at a banquet held in the Curris Center Murray Room on April 21.